Poster designed by Ranjit Kandalgaonkar, Tarek Salhany, Anurita Argal, Devyani Argal, Stefano Harney and Amit Rai. The School for Study is a project originating with a collective of scholars and teachers at the Queen Mary School of Business and Management, at the University of London in the UK. The collective developed ‘within and against’ the university, within and against the disciplines, and within and against institutional pedagogy and research. 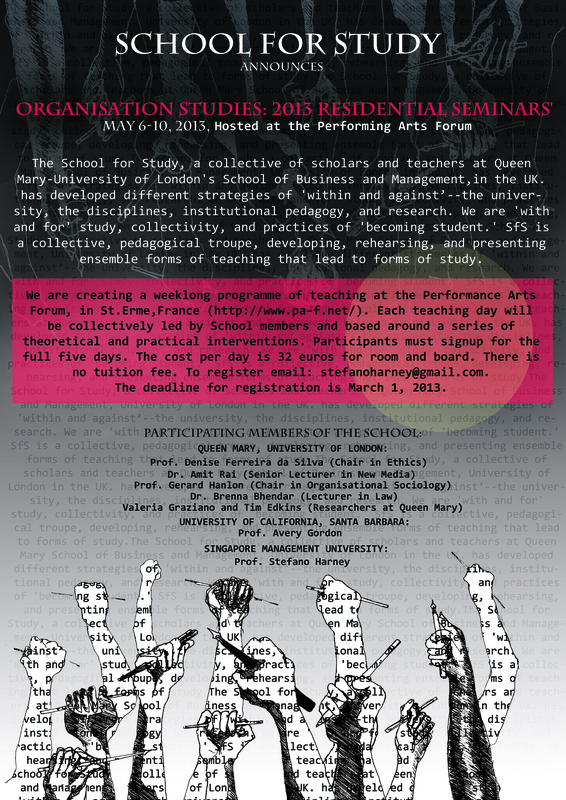 At the same time our collective developed ‘with and for’ study, with and for collectivity, and with and for ‘becoming student.’ The School operates not just as a collective but as a pedagogical troupe, developing, rehearsing, and presenting ensemble forms of teaching that lead to forms of study. The weeklong programme of teaching at the Performance Arts Forum, in St Erme, France (http://www.pa-f.net/) will be structured into two, two-day blocks with Wednesday devoted to the organisation of a publication based on the week, led by PAF’s Marten Spanberg. Each teaching day will be collectively led by School members and based around a series of theoretical themes and thinkers. Participants must signup for the full five days. The cost per day is 32 euros for room and board. There is no tuition fee. Registration is by email to: The deadline for registration is December 31st. Professor Denise Ferreira da Silva is Chair in Ethics, Dr. Amit Rai is Senior Lecturer in New Media, Professor Gerard Hanlon is Chair in Organisational Sociology, Dr Brenna Bhendar is Senior Lecturere in Law, all at Queen Mary, University of London. Valeria Graziano and Tim Edkins are researchers at Queen Mary. Professor Avery Gordon teaches at the University of California, Santa Barbara, and Professor Stefano Harney teaches at Singapore Management University.